Cruise America is the largest provider of rental motorhomes in North America. With over 4,000 vehicles and 23 locations in the United States it offers its customers unparalleled flexibility in planning their motorhome vacation. Based on their years of experience, Cruise America has custom designed their motorhomes to optimize them for international travelers, maximizing storage and keeping things simple to provide an affordable motorhome vacation. This compact motorhome is a fully self-contained RV with a sleek aerodynamic design. The floorplan features a unique rear kitchen design with all the amenities of a larger unit. The cabover bed is extra roomy making the compact RV the ideal unit for two adults of any age and a dinette folding to an extra bed allows for kids too. With six foot six inch ceilings and walk through convenience even tall campers can enjoy the compact RV. This model has been a staple in the Cruise America fleet for many years. Offering two full size beds and a Dinette which can be transformed into another small bed (approx. 97cm x 1,78m), this traditional motorhome comfortable houses two couples or small families (up to 5 passangers). The C30 Large Motorhome is, like its name suggests, the largest motorhome in Cruise America’s fleet. A unique feature of this motorhome is the closed off bedroom in the back of the vehicle which provides added privacy from fellow travelers and an almost 1,50m wide bed. The rest of the motorhome also provides plenty of sleeping opportunities! There is a cabover bed, a pull out sofa bed, and, like its two smaller brothers, the C30 also features a dinette that can be turned into another bed. 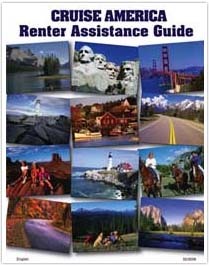 Cruise America is not the only motorhome rental company in the United States! Checkout what their competitors like Road Bear, Britz, Apollo RV, El Monte RV or Best Time RV have to offer. If you still need help deciding, please give us a call and our experienced sales team will be happy to answer any questions you may have! You can reach us @ + 49 (0)30 – 707 93 40 . We are looking forward to your call!